“Fr. Mc Manus, from his Capitol Hill office, has been a prominent and influential figure in the quest for progress and peace with justice in Northern Ireland, blending knowledge of his native land with experience drawn from his years of dealing with the intricacies of the political system in his adopted one. His has been a unique role. Long may it continue.”—Ray O” Hanlon, Editor. Keith Carney, a National Director of the AOH and justice in Northern Ireland, Editor of Hibernian Digest: “There is simply no other book like this. 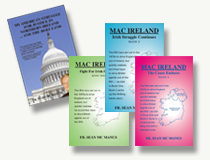 It provides an unequaled account of how the Congress was kept on track … on opposing anti-Catholic discrimination in Northern Ireland, the Mac Bride Principles, and a host of other issues”. 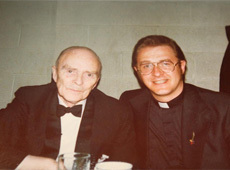 Peggy Dee, D.C. LAOH:“For almost 40 years, Fr. Mc Manus has been working for peace and justice for Northern Ireland. He is to be admired for his dedication and devotion to this Cause. I enthusiastically look forward to his Memoirs and consider this a valuable read for all interested in Irish politics. Tom Halton, Professor Emeritus, The Catholic University of America, “The word I always associate with Fr. Sean Mc Manus is adamantine—having the hardness and luster of a diamond. I have seen him in action countless times on Capitol Hill, so I can fearlessly proclaim that his book will gleam with the luster of a diamond. Andrew Healy, longtime GAA promoter: “ Fr. Mc Manus reveals in his Memoirs the central role the GAA played in his family’s life in Fermanagh, telling us that “ the GAA was in the blood”. May the GAA be in the blood of all Irish-Americans in the greater Washington area, and may we all celebrate the publishing of his Memoirs”. Bill Hughes, Internet Commentator and author: “ I have known Fr. Mc Manus since he first made landfall in my native city of Baltimore in 1972. I have been proud to stand with him in many battles for Irish justice. I regard his Memoirs of singular importance – an essential slice of Irish-American history”. Kathy Lay, President¸ MD LAOH: “The LAOH has always supported the outstanding work of Fr. Mc Manus. He has championed peace and justice for Catholics in Northern Ireland in the U.S. Congress for nearly 40 years. His Memoirs are of great importance. “Roscommon-born Professor Coilin Owens, a Joyce scholar: ‘When the history of Irish-American engagement in bringing the Troubles to a just conclusion is written, it will have to weigh the persistent and fearless efforts of Fr. McManus. His account of how the Irish National Caucus worked for decades to shape Irish-American opinion and persuade the U.S. Congress on the real issues in Northern Ireland is an important part of the story. George Rogers, Immed. Past President DC AOH:”Fr. Sean McManus has been a fixture on the front lines in the fight for TRUE peace and justice in the North of Ireland. His unwavering work and support have been invaluable to the Catholic/Nationalists in the North and his work on educating and informing folks here in the USA has gained much American support for the cause of justice in the North of Ireland”. The Committee’s first meeting will be January 17, 2011 – by invitation only. Washington Irish Committee. P.O. BOX 15128, Washington, DC. 20003-0849.